Enjoy resort style living in the sought after community of PebbleCreek. This quiet cul de sac lot is just a short walk to the new Oasis Community Pool House and a short drive to the I10 and 303 Freeways. The 3 bedroom vacation home built in 2010 has a full CASITA with it’s very own porch and incomparable patio views and close to the walking path. Why build with over $100,000 in upgrades in this beautiful Sonata! Alder wood raised panel cabinets, roll out cabinet drawers, under cabinet lighting, retractable exhaust hood and double edged granite in the kitchen. Master has hand scraped maple wood flooring, private patio exit and a large en suite with access to the laundry. The golf cart garage space, flagstone pavers and much more. 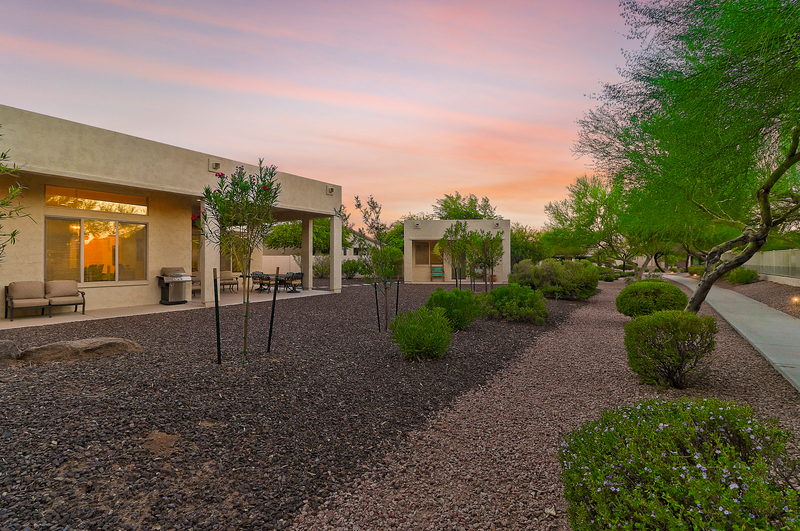 Take the Video Tour by clicking on the link below and call for a private showing (480) 772-1120. Click Here to Take Video Tour! Click Here for Additional Listing Information!